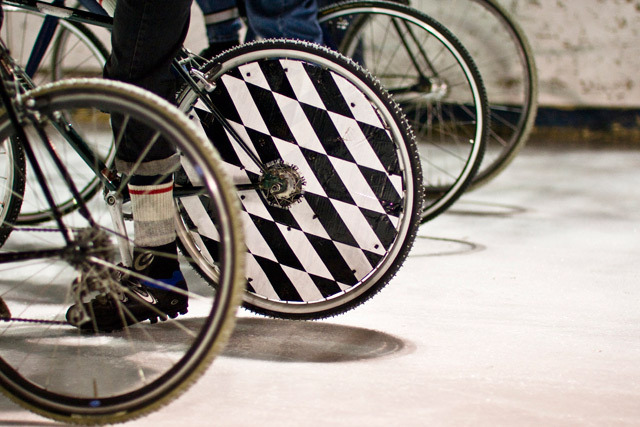 Welcome to the Ice Bike Races. Often called Icycle, this annual event got its start about fourteen years ago, on the Toronto Islands; back then, a group of bike messengers would stud their tires and race around one of the islands. That ended when someone fell through the ice. “Nobody died,” Bercarich says, but the race was moved to sturdier terrain. For the past few years the races have been held on the rink at Dufferin Grove Park, and that’s where about one hundred spectators gathered this past Saturday, cramming into the players bench and lining the outside fence to catch the action. The event is run by Derek Chadbourne, owner of the Bike Joint on Harbord Street. Bike Pirates, a non-profit, do-it-yourself workspace for cyclists, helps out, and has hosted the afterparty for the last three years. To be able to race, the cyclists have to stud their tires, a process that involves drilling screws though (or “studding”) the tires, then lining the tire with duct tape (or, in some cases, with another tire). Apparently, once the process is complete the actual tire doesn’t even touch the ice. And just like other sporting events, someone is always tweaking the technology to get an edge: by using hundreds of small, thin screws and setting them in a specific pattern, some of the fastest riders this year were able to give themselves an extra push. “They’re that thin,” Bercarich says, pinching his fingers together—and there are up to eight hundred in a tire. In classic format, the bikers race in heats, with the winners from the men’s and women’s divisions moving on to the finals; finalists race an intense twenty-five laps around two connected ice rinks. This year’s winners were the intrepid Kevin Black and Briana Illingworth (know on the circuit as the Ice Queen). Every year, proceeds raised at the afterparty are donated to a worthy cause: this time, to Peter McKenzie, a cyclist who was hit on the Bloor Viaduct in December. One of the final events of the night, the Rubber Race, allows any spectator with a bike and a helmet to participate. The only catch: no studded tires. Immediately after it begins, over-eager cyclists—many of whom have started too fast—fall onto the ice. The Rubber Race is a slow one, and after a couple laps most cyclists have lost their balance and dropped off their bikes at least once. The only rider who could stay on her seat consistently was at a huge disadvantage—she was on just one wheel. “I’ve been riding a unicycle for about seven years, maybe. But only seriously in the last three,” Celeste Koon told us. As she rounded the turn of her final lap, the crowd went crazy, clapping and hitting the boards. She gracefully dismounted her unicycle and stepped between fallen cyclists on her way off the rink. dandyhorse magazine‘s editorial assistant Colleen Kirley and dandy photo editor Nana Arbova send bike love to Torontoist readers with this feature. You’ll be able able to see more of their work in dandyhorse this spring.